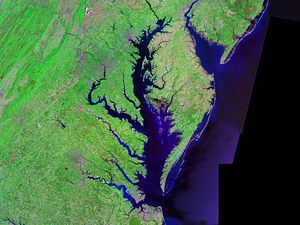 The Chesapeake Bay is the largest inlet in the Atlantic Coastal Plain and forms the largest estuary in the United States. It is one of the most productive bodies of water in the world. It lies off the Atlantic Ocean, surrounded by Maryland and Virginia. The Chesapeake Bay's watershed covers 64,299 square miles (166,534 km²) in the District of Columbia and parts of six states: New York, Pennsylvania, Delaware, Maryland, Virginia, and West Virginia. More than 150 rivers and streams drain into the Bay. The Chesapeake Bay is nearly 200 miles (300 km) long, from the Susquehanna River in the north to the Atlantic Ocean in the south. At its narrowest point it is 2.8 miles (4.5 km) wide; at its widest point, just south of the mouth of the Potomac River, it is 30 miles (50 km) wide. Total shoreline for the Bay and its tributaries is 11,684 miles (18,804 km), and the surface area of the bay and its major tributaries is 4,479 square miles (11,601 km²). 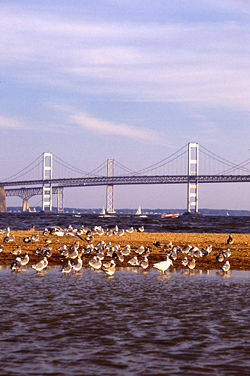 The Chesapeake Bay played an important role in the settlement of the United States. Spanish and French explorers reached the bay in the 1500s, and explorers sailed up the James River in the 1570s. In 1607 the Jamestown Settlement became the first permanent English settlement in North America. The bay forms a complex ecosystem that includes important habitats and food webs. The wetlands, rivers, and forests of the region, as well as the bay itself, provide food, homes, and protection for complex groups of plant and animal life. The word Chesepiooc is an Algonquian word commonly believed to mean "Great Shellfish Bay." A reconstruction of Virginian Algonquian language implies that the word may mean something like "Great Water." It may have also been the name of a Native village at the mouth of the bay. The Chesapeake Bay Bridge, a major twin-span bridge in Maryland, connects the Baltimore-Washington Metropolitan Area with tourist destinations such as Ocean City, Maryland, Delaware's ocean resorts, Assateague Island, and Chincoteague, Virginia. The Chesapeake Bay, at 193 miles (311 km) long and 3 to 30 miles (5 to 50 km) wide, is the largest inlet in the Atlantic Coastal Plain. It is created by the submergence of the lower courses of the Susquehanna River and its tributaries. Maryland borders the bay in the north, while Virginia forms its southern border. Its entrance from the Atlantic Ocean is flanked by Cape Charles to the north and Cape Henry to the south. The eastern shore is generally irregular, low, and marshy, while the western shore tends to be straighter and filled with cliffs for most of its distance. Baltimore, at the head of the tidal portion of the Patapsco River, an arm of the Chesapeake, is the bay's chief port on its northern portion. The Chesapeake and Delaware Canal, a 14-mile (23-km) long, 450-foot (137-m) wide and 35-foot (11-m) deep ship canal that cuts across the states of Maryland and Delaware, connects the waters of the Delaware River with those of the Chesapeake and connects the head of the bay with the Delaware River estuary. The Hampton Roads region in southeastern Virginia is one of the world's largest natural harbors, and incorporates the mouths of the Elizabeth and James Rivers with several smaller rivers and itself empties into the Chesapeake Bay near its mouth at the Atlantic Ocean. It is notable for its year-round ice-free harbor, for United States Navy, Coast Guard, Air Force, NASA, Marines, and Army facilities, shipyards, coal piers, and hundreds of miles of waterfront property and beaches, all of which contribute to the diversity and stability of the region's economy. Some of the cities along Hampton Roads include Chesapeake, Franklin, Hampton, Newport News, Norfolk, Poquoson, Portsmouth, Suffolk, Virginia Beach, and Williamsburg. The bay is spanned in two places. The Chesapeake Bay Bridge crosses the bay in Maryland from Sandy Point (near Annapolis) to Kent Island; the Chesapeake Bay Bridge-Tunnel in Virginia connects Virginia Beach to Cape Charles. The climate of the area surrounding the bay is primarily humid subtropical, with hot, very humid summers and cold to mild winters. Only the area around the mouth of the Susquehanna River is continental in nature, and the mouth of the Susquehanna River and the Susquehanna flats often freeze in winter. It is exceedingly rare for the surface of the bay to freeze in winter, as happened most recently in the winter of 1976-1977. The Chesapeake Bay is the ria, or drowned valley, of the Susquehanna River, meaning that was where the river flowed when sea level was lower. It is not a fjord, as the Laurentide Ice Sheet never reached as far south as the northernmost point on the bay. The Bay was formed starting about 10,000 years ago when rising sea levels at the end of the last ice age flooded the Susquehanna river valley. The Bay's geology, its present form and its very location have also been affected by a bolide impact event at the end of the Eocene (about 35.5 million years ago), forming the Chesapeake Bay impact crater. Parts of the bay, especially the Calvert County, Maryland coastline, are lined by cliffs composed of deposits from receding waters millions of years ago. These cliffs, generally known as Calvert Cliffs, are famous for their fossils, especially fossilized shark teeth, which are commonly found washed up on the beaches next to the cliffs. Scientists' Cliffs is a beach community in Calvert County named for the desire to create a retreat for scientists when the community was founded in 1935. The average depth of the bay varies by source, but includes such figures as 21 feet (6.4 meters), including tributaries, 25 feet (7.62 m), and  and 30 feet deep (9.14 m) It is estimated that over 24 percent of the bay is less than 6 ft (2 m) deep. As an estuary, Chesapeake Bay has brackish water—water that has more salinity than fresh water, but less than seawater, resulting from the mixing of Atlantic water with fresh river water. The bay's water has three salinity zones — oligohaline, mesohaline, and polyhaline. The fresh water zone runs from the mouth of the Susquehanna River to north Baltimore. The oligohaline zone has very little salt. Salinity varies from 0.5 ppt to 10 ppt and freshwater species can survive there. The north end of the oligohaline zone is north Baltimore and the south end is the Chesapeake Bay Bridge. The mesohaline zone has a medium amount of salt and runs from the Bay Bridge to the mouth of the Rapahannock River. The salinity ranges from 10.7 ppt to 18 ppt. Captain John Smith of England, who explored and mapped the bay and its estuaries between 1607 and 1609. Lucas Vásquez de Ayllón, a licentiate and sugar planter on Hispaniola, was the first European to explore the Chesapeake Bay. In quest of the Northwest passage, Ayllon sailed north from Hispaniola in 1524, and tried the James River and Chesapeake Bay as routes. He received from Charles V a grant of the land he had discovered. The employment of African slaves in building a settlement is perhaps the first instance of African slave-labor within the present territory of the United States. Ayllon died of ship fever, and of the colony of 600 people he had brought with him only 150 survivors made their way back to Hispaniola. The short-lived mission settlement he established, "San Miguel de Guadalupe," was near the future site of Jamestown. In December 1606, 108 men set sail from England with a charter from the Virginia Company of London to establish a colony in the Chesapeake Bay region. After a five-month voyage the three ships under Captain Christopher Newport made their first landing at a place they named Cape Henry in April 1607. They were under orders to select a more secure location, and after setting up a cross and giving thanks for solid ground, they set about exploring the Hampton Roads region and a tributary they named the James River, in honor of their king, James I of England. On May 14, 1607, they selected Jamestown Island on the James River about 40 miles (62 km) inland from the Atlantic Ocean and the entrance to the Chesapeake Bay. The location was chosen due to the deep water surrounding the island and because it was a strategic defensive position in the event of approaching Spanish ships. 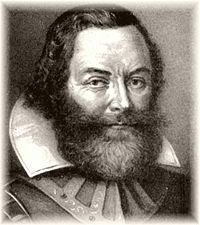 Captain John Smith of England explored and mapped the bay and its estuaries between 1607 and 1609. Soon afterward settlers came to the bay’s easily accessible, well-protected shores. The Chesapeake Bay was the site of the Battle of the Chesapeake in 1781, during which the French fleet defeated the Royal Navy in the decisive naval battle of the American Revolutionary War. In the War of 1812, the British invaded through Chesapeake Bay. Today, the body of water is less productive than it used to be because of runoff from urban areas (mostly on the Western Shore) and farms (especially on the Eastern Shore), over-harvesting, and invasion of foreign species. The bay though, still yields more fish and shellfish (about 45,000 short tons or 40,000 tonnes yearly) than any other estuary in the United States. The bay is famous for its rockfish, also known as striped bass. Once on the verge of extinction, rockfish have made a significant comeback due to legislative action that put a moratorium on rockfishing, which allowed the species to repopulate. Rockfish are now able to be fished in strictly controlled and limited quantities. Oyster farming is a growing industry, helping to maintain the bay's productivity as well as a natural effort for filtering impurities in an effort to reduce the disastrous effects of man-made pollution. In 2005, local governments began debate on the introduction to certain parts of the bay of a species of Asian oyster, in an effort to revive the lagging shellfish industry. The Chesapeake Bay is the largest estuary in the United States and is one of the most productive bodies of water in the world. In the 1970s, the Chesapeake Bay contained one of the planet's first identified marine dead zones, where hypoxic waters were so depleted in oxygen they were unable to support life, resulting in massive fish kills. Large algae blooms, nourished by the runoff of farm and industrial waste throughout the watershed, prevented sunlight from reaching the bottom of the bay. The resulting loss of aquatic vegetation has depleted the habitat for many of the bay's animal creatures. One particularly harmful algae is Pfiesteria piscicida, which can affect both fish and humans. The depletion of oysters due to overharvesting and damaged habitat has had a particularly harmful effect on the quality of the bay. The bay's oyster industry has also suffered from two diseases: MSX and Dermo. Oysters serve as natural water filters, and their decline has further reduced the water quality of the bay. Water that was once clear for meters is now so turbid that a wader may lose sight of his feet before his knees are wet. Efforts of federal, state and local governments, working in partnership through the Chesapeake Bay Program, and the Chesapeake Bay Foundation and other nonprofit environmental groups, to restore or at least maintain the current water quality have had mixed results. One particular obstacle to cleaning up the bay is that much of the polluting substances arise far upstream in tributaries lying within states far removed from the bay itself. A 722-acre (2.9 km²) tidal, riverine system at Jug Bay Wetlands Sanctuary located 20 miles (32 km) from Washington, D.C.
A 3,426-acre (14 km²) salt marsh at the Monie Bay component located 20 miles (32 km) from Salisbury, Maryland. Monie Bay was designated as a reserve in 1985. Jug Bay and Otter Point Creek were designated in 1990. 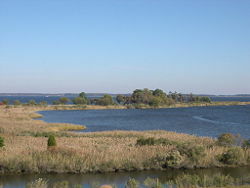 The purpose of the 4,820-acre (20 km²) Maryland Reserve, managed by the Maryland Department of Natural Resources, is to manage protected estuarine areas as natural field laboratories and to develop and implement a coordinated program of research, monitoring, education and volunteer activities. It is part of the larger National Estuarine Research Reserve System, a network of protected areas established for long-term research, education and stewardship. The system is composed of partnerships between the National Oceanic and Atmospheric Administration (NOAA) and coastal states, and protects more than one million acres of estuarine land and water in the U.S. 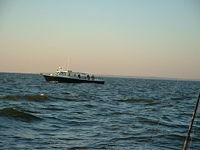 The Chesapeake Bay is a main feature for tourists who visit Maryland and Virginia each year. Fishing, crabbing, swimming, boating and sailing are extremely popular activities enjoyed on the waters of the Chesapeake Bay. The bay's tourism has a major impact on Maryland's economy. Captain John Smith Chesapeake National Historic Trail, created in July 2006, is a series of water routes extending approximately 3,000 miles (4,800 km) along Chesapeake Bay and its tributaries in Virginia, Maryland, Delaware, and in the District of Columbia. The historic routes trace the 1607–1609 voyages of Captain John Smith to chart the land and waterways of the Chesapeake. The trail was the first-ever all-water National Historic Trail in the United States. ↑ TIME Magazine, January 31, 1977. The Big Freeze Retrieved December 5, 2008. ↑ U.S. Geological Survey, October 1998, The Chesapeake Bay: Geologic Product of Rising Sea Level Retrieved December 5, 2008. ↑ Scientists Cliffs Association. Scientists Cliffs FAQ Retrieved December 5, 2008. ↑ Chesapeake Bay Foundation. Geography Retrieved December 5, 2008. ↑ Maryland State Archives. Charting the Chesapeake Retrieved December 5, 2008. ↑ University of Maryland Center for Environmental Science. Healthy Chesapeake Waterways Retrieved December 5, 2008. ↑ Chesapeake Bay Gateways Network. 2007. Chesapeake Bay Workboats Retrieved December 5, 2008. ↑ Department of Environmental and Aquatic Animal Health, Virginia Institute of Marine Science. March 16, 2007. Shellfish Pathology Laboratory Retrieved December 5, 2008. Fahrenthold, David A. December 12, 2006. A Dead Indian Language Is Brought Back to Life Washington Post. Retrieved December 5, 2008. Geological Survey (U.S.), Emery T. Cleaves, Gerald Martin Richmond, David S. Fullerton, and David L. Weide. 2006. Quaternary geologic map of the Chesapeake Bay 4⁰ x 6⁰ quadrangle, United States. Quaternary geologic atlas of the United States. Reston, Va: U.S. Dept. of the Interior, U.S. Geological Survey. Online version. Maryland Sea Grant. The Living Chesapeake Retrieved November 19, 2008. This page was last modified on 9 February 2017, at 19:38.